We use high quality, industrial grade liquid asphalt sealer on all of our applications. Our liquid asphalt is an oil-based product which is easily absorbed into the asphalt surface. Don’t be fooled by the do-it-yourself products in the stores which are “water based”. Asphalt is not made up of water so by using “water based” products the sealer will just sit on top of the driveway and won’t actually soak into the asphalt. If water based sealer was the best choice then you would see municipalities using that on their roads. 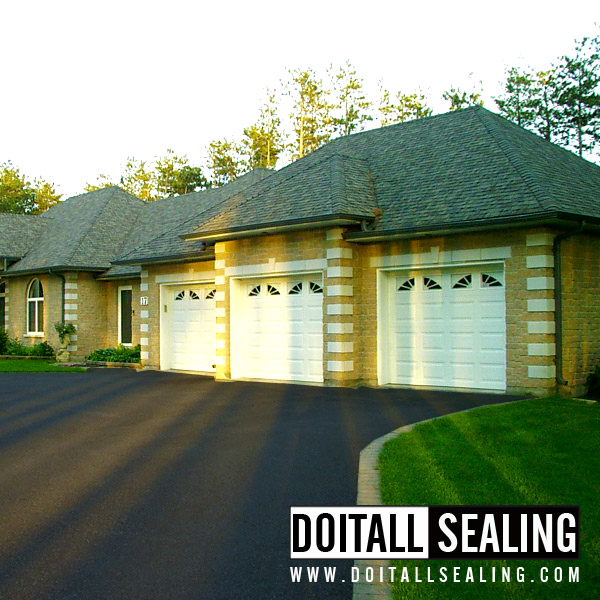 Do It All Sealing will provide and apply that commercial grade product saving you the hassle and time. Asphalt sealing is recommended at least once a year to maximize the life of your asphalt. Asphalt sealing will renew the pavement appearance and will give it that fresh newly paved look making your property much more appealing. This is why Do It All Sealing works closely with Real Estate agents sealing driveways making the property much more appealing to potential buyers. Applying Liquid Asphalt once every year can double the life of your asphalt. This means greater savings for you by not spending it on new asphalt or repairs as often.